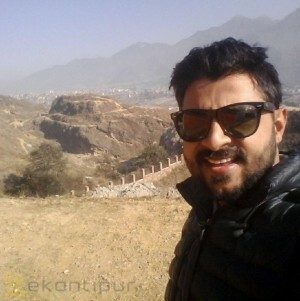 Anup Ojha is a journalist associated with the English Daily The Kathmandu Post for the past eight years now. Apart from being a journalist, he is a singer, composer and lyricist. He is also a story teller who has coined his own genre 'Gauney Katha' a way of telling story of common people through song. Born in Byas Municipality-8 of Tanahun district, Ojha has completed his Master's Digree in English Literature from Tribhuvan University. Ojha started his journalism career writing reviews and profiles of influential artist in Nepali theater, film and literary circle. He has extensively interviewed influential people from both national and international arenas for English Daily. Now he writes about social issues. He is also a theater artist, a student under Sunil Pokharel of Gyan DYS-4 batch. Ojha also work as motivational speakerfor the students.